Someone asked me recently what my desert island food would be. I went through the usual suspects, pizza, burritos, macaroni and cheese and then it came to me. A salad of course! 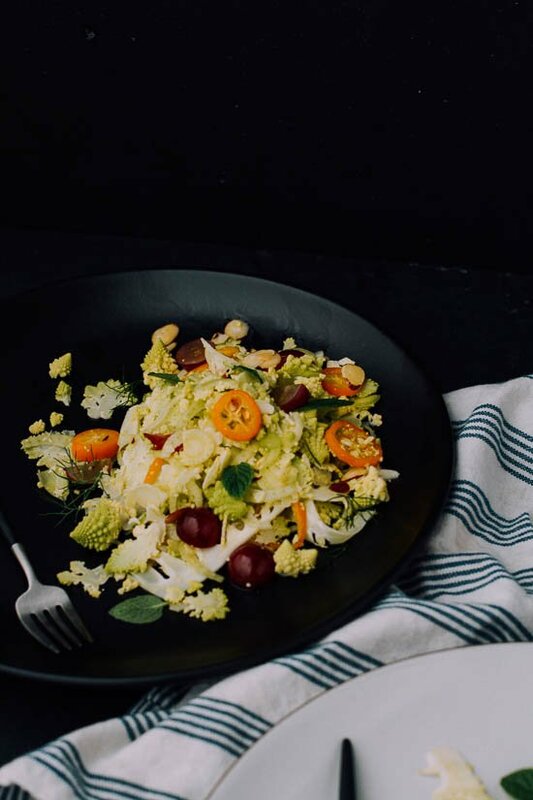 I never get tired of eating salad, they are heathy, beautiful and a great way to empty out the fridge and if you think outside of the box the variations are infinite. These days I rarely rely on lettuce as the base of my salad. There were days when iceberg lettuce and blue cheese dressing was my definition of a salad but I’ve had a great time experimenting with unusual ingredients for my salads. I’m always stumped when people tell me they have a hard time making a salad. I think the keys are to try for different textures and flavor profiles that work well together and don’t overdress your salad! 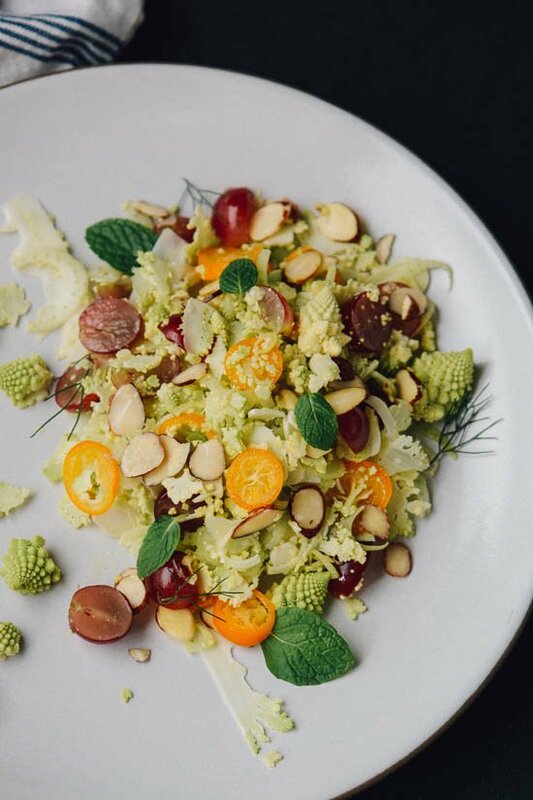 I posted a shaved cauliflower salad a while back and when I picked up a beautiful head of romanesco at the market my first thought was would this work the same way? I actually took a few minutes to check out Instagram to see if there were any interesting recipes out there and I have to say that I didn’t find any. 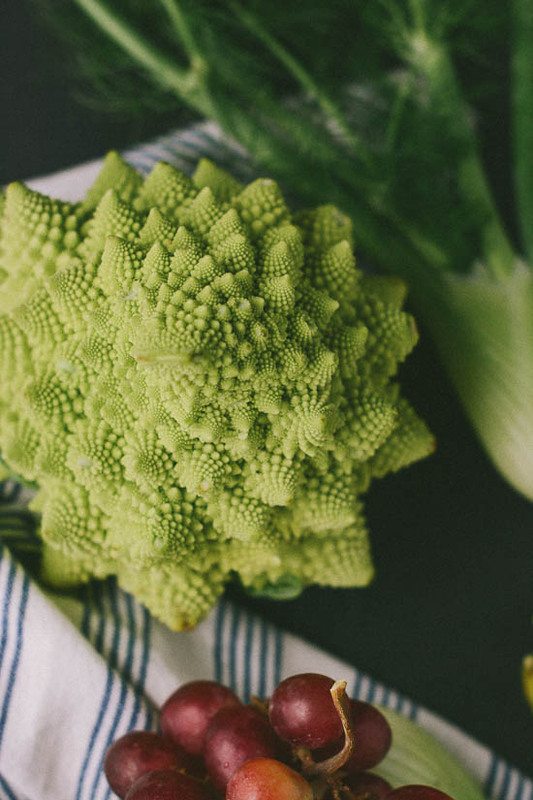 I did see a lot of people holding up a romanesco amazed at the outer space quality of this most unique veggie. 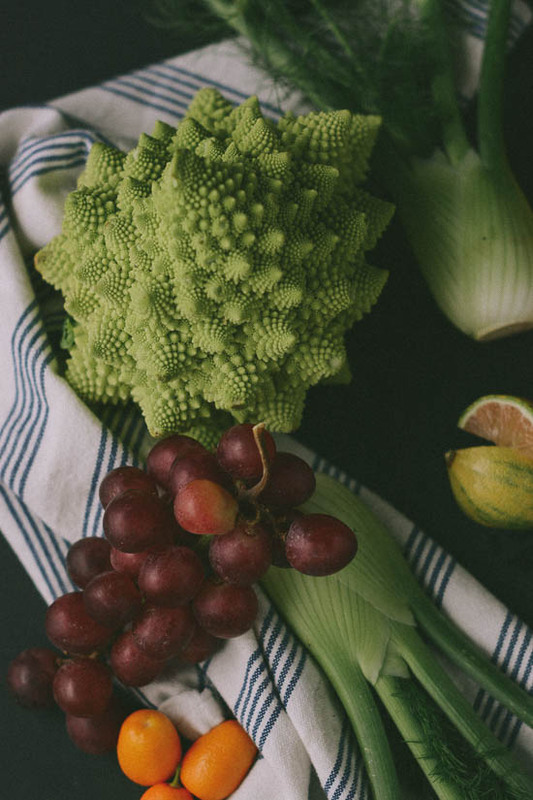 If you aren’t familiar with romanesco, it’s a relative of broccoli and cauliflower with a sweet, mild flavor that is less bitter than broccoli and more tender than cauliflower. It’s lovely fractal spiraling appearance is what catches most people’s attention, but I think it’s really under appreciated. 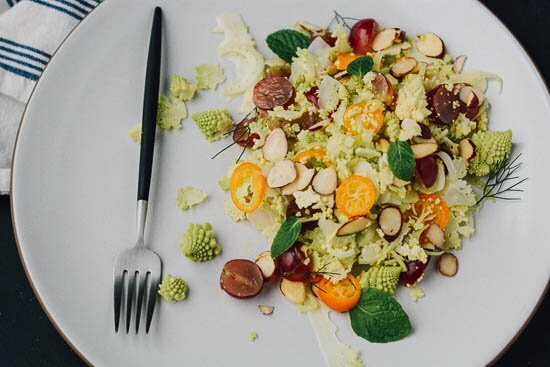 Most recipes call for roasting it over high heat, but I think it’s lovely shaved into a fresh winter salad. To get the thinnest possible slices, I highly recommend using a mandoline if you have one. You don’t need to spend a lot of money on one, my favorite is about $20.00, and I use it almost every day. I will say use the finger guard, though, or you will probably find out the hard way just how sharp these babies can be. 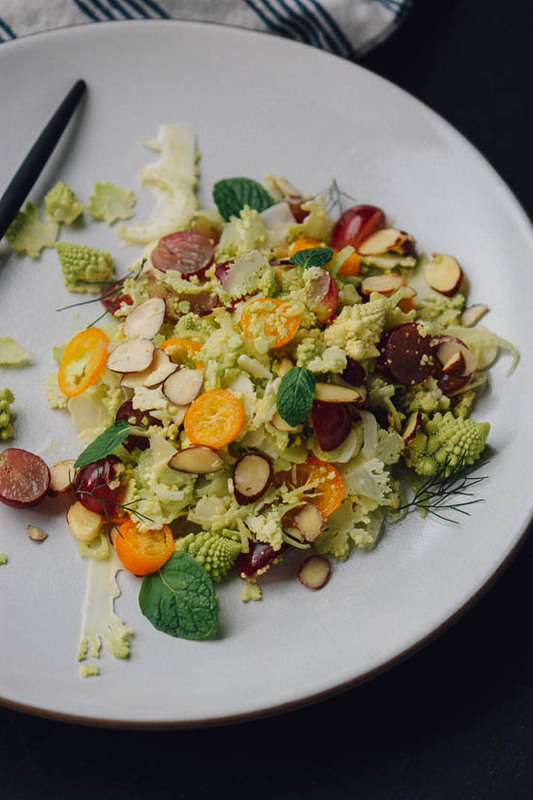 As you shave the romanesco don’t worry if little bits and pieces fall off into your bowl, it just adds to the texture of the salad and lets people know what they are eating. 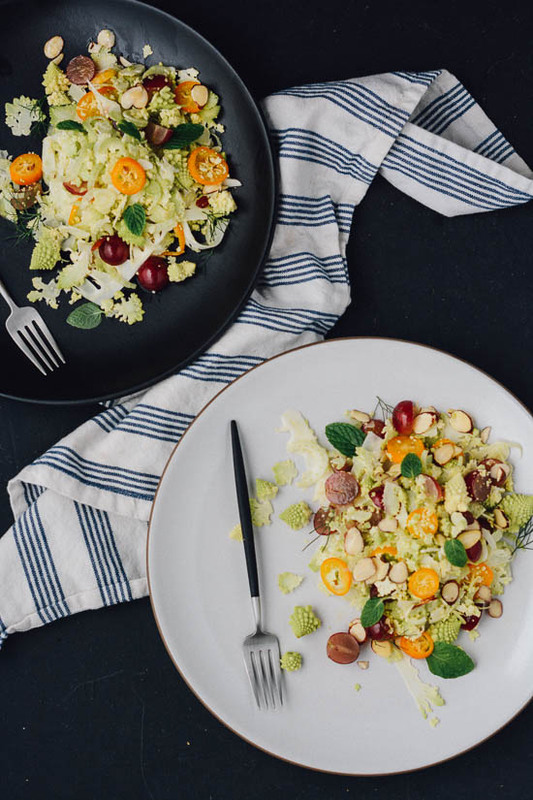 I love the fact that the salad is almost devoid of color with the base of the salad coming from the fennel and romanesco with the little pops of color coming from the fruit and herbs. I have decided to declare myself a salad person. It’s my specialty, I can whip up a salad from pretty much anything in my fridge. What are your favorite ways to enjoy a salad? 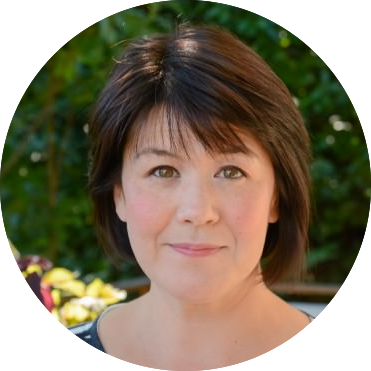 I’d love to hear ideas from you about salads or any recipes you’d like to see here on the blog! 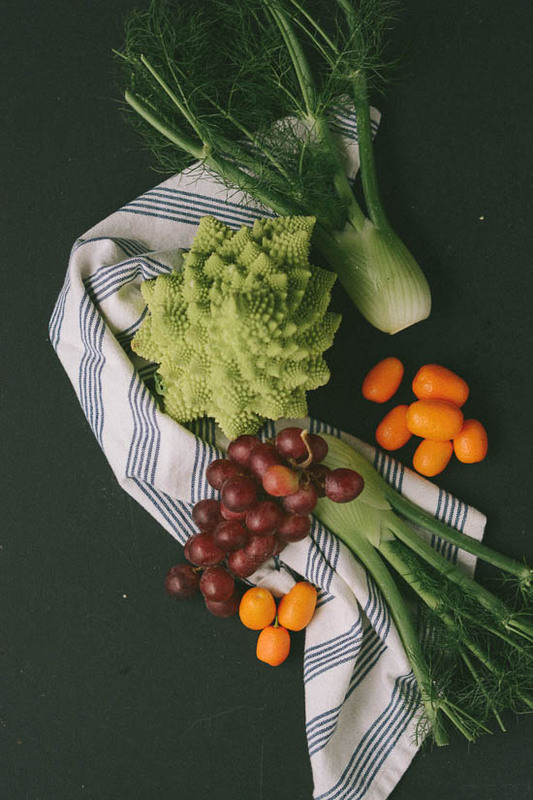 Cut the romanesco in half and using a mandoline, thinly slice the romanesco into a large bowl. Don't worry if little pieces fall off, just focus on the center stem and let the rest fall into the bowl. Repeat with the fennel. 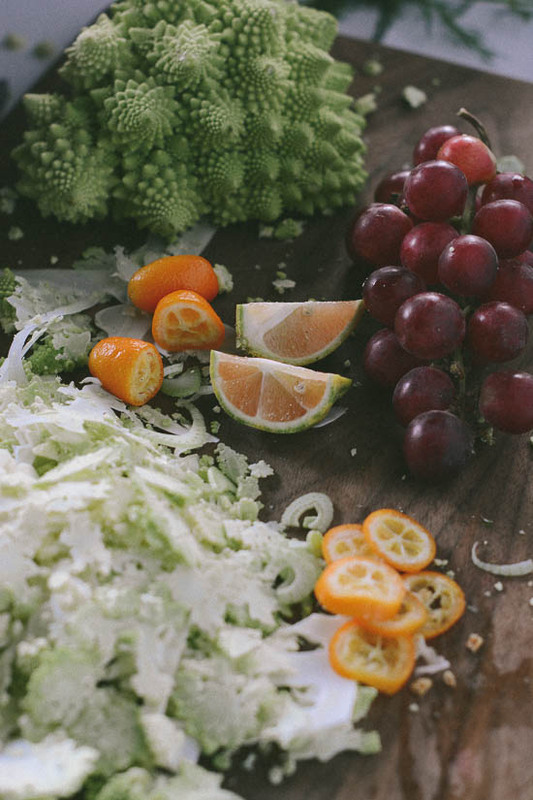 Add the grapes, kumquats, mint and some of the fennel fronds. In a small bowl combine the lime juice, rice vinegar, honey and extra-virgin olive oil and whisk to combine. Pour the dressing over the vegetables and lightly toss to combine. Serve with a sprinkle of almonds and some additional herbs. I hope you like the recipe if you try it, it’s one of my current favorites!